Every athlete performs stretching. Unfortunately, little is unknown about this common practice. Recently, it has been suggested static stretching directly before sprint impairs speed and force production. Moreover, static stretching is not linked to injury prevention, despite popular belief. One area of static stretching that is beneficial is the strength. 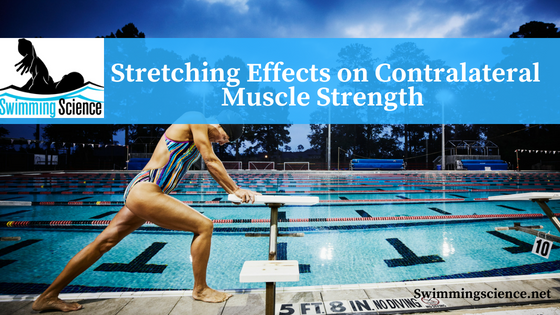 Multiple studies suggest repeated stretching on a specific muscle group will increase the strength on the side stretched. Surprisingly, stretching has also been reported to improve strength on the opposite, non- stretched side. This is known as crosstraining, cross-education, or the cross-transfer effect. This improvement is theorized to improve secondary to central alterations in motor learning, as opposed to peripheral changes. The purpose of this study was to investigate whether a unilateral stretching program would induce a crosstraining effect in the contralateral muscle. Twenty-five participants were assessed for ankle range of motion and calf strength (calf raise) on both legs. Then 13 participants were assigned to a treatment (TR) whereas the other 12 were assigned to the control group (C). The training group performed right calf stretching. The stretching consisted of four rounds of 30 seconds stretching, followed by 30 seconds rest and was performed 3 days/week for 10 weeks. The control group did not participate in any supervised activity. The range of motion of the right ankle improved 8% and the nonstretched TR left ankle improved 1%. The C calves did not significantly improve. The right calf in the TR group improved strength by 29% and the nonstretched TR left ankle improved 11% in calf raise. Both calves in the C group were unchanged. The results of this study suggest a crosstraining effect occurred in the opposite limb. Moreover, it confirms stretching results in strength gains in the stretched calf (a theory questioned by many). Improvements are still believed to be secondary to central alterations, as stretching results in afferent nerve activity, but no motor neuron activity. Future studies must assess results in a highly trained group and provide a comparable training group, rather than a control. Moreover, the reason for a crosstraining effect is necessary for further research. However, until then it seems a static calf stretching routine improves strength and range of motion in both ankles. This study was hotly debated in online exercise science blogs. Nelson AG, Kokkonen J, Winchester JB, Kalani W, Peterson K, Kenly MS, Arnall DA. A 10-week stretching program increases strength in the contralateral muscle. J Strength Cond Res. 2012 Mar;26(3):832-6.